In biology water is considered as the main evidence for the life. Therefore, astronomers who preferred to find life on a another planet do researches for finding water. As the results of these researches NASA scientists found gypsum mineral on Mars proving that there was water on mars million years ago. After few years of that finding, The scientist found there is liquid water on Current mars. The NASA’s scientists were found seasonal flowing hydrated salt (salt dissolved in water) lines. Due to these salty water flowing there are dark streaks on mars known as “recurring slope lineae” or RSL. NASA’s Mars Reconnaissance Orbiter (MRO) helps to observe these RSL. Using It’s imaging spectrometer researchers detected signatures of hydrated minerals on slopes where streaks are seen on Mars. The salts keep water at liquid phase without freezing even at extremely cold temperature on mars. But after particular temperature, These water get into solid state. So, It can be observe liquid water on mars only in the warmth seasons. According to chemical signals scientists said that these water flows may contains magnesium perchlorate, magnesium chlorate and sodium perchlorate salts. 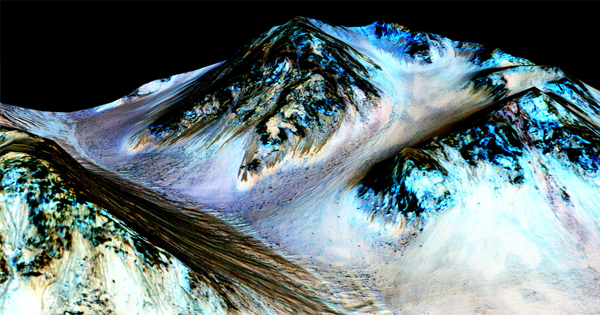 Scientists have done many projects for finding water on mars for years. but they were cached only few sings about old water on mars. Now, this new liquid water evidence on present day mars will break the pattern of finding life on mars As well as the Mars One Mission.